Soberdrive from Cirencester College were recently awarded first place in Hyundai Motor UK's third annual 'Skills for the Future' competition, held at its Training Academy in High Wycombe. panel due to their innovative and unique product, excellent presentation and teamwork skills. The team created a device that fits perfectly onto a car key, turning it into a portable breathalyser - the device would then advise if the user was over the legal alcohol limit. 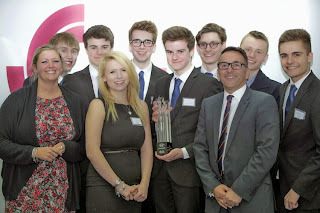 "All of the judges were so impressed with the calibre of each of the ideas put forward by the students. It was incredibly difficult to choose a winner, but the Soberdrive team clinched it thanks to their strong presentation, their professional attitudes, and, of course, their truly unique and creative product," said Tony Whitehorn, Hyundai's President & CEO. "It's so important that we support the business leaders of tomorrow, and Hyundai's 'Skills for the Future' initiative allows us to do that. I hope that this experience stays with each of the students when they leave education and enter the business world." George Kershaw Houghton, MD, Soberdrive, added, "Skills for the Future has allowed us to do things that we never thought would be possible, it's taught us invaluable lessons which we'll all be able to take with us for the rest of our working lives. It's a really good feeling to know that we created something from scratch, which could potentially be a really successful product and business."